Formula E boasts its new Gen2 car, which has significant technological advances over the original machine, with the power output rising from 268 horsepower to 335, and the top speed going up to 174mph. Compared to Formula 1 cars these figures are still unimpressive, but they do show progress. Teams can now run their own motors, transmissions and inverters, and there are new batteries from McLaren Applied Technologies, replacing the original Williams-built versions. The cars will now be able to run full race distances without the need for a car swap, even if the races are still only 45 minutes long, plus one lap, which means that they’ll be around 60 miles – one third the length of a Grand Prix. In order to achieve non-stop races, the new cars have bigger batteries and, as a result, are considerably heavier than before. The new batteries weigh 385kgs, up from 320kgs last year, while the minimum weight has moved from 800kgs to 900kgs. Formula One cars weigh in at 734kgs, and even then many in the racing world think this is way too heavy. The problem for Formula E is that battery development is currently not moving fast enough to allow the series to make the other changes it would like to make. It currently races only on street tracks, as the cars would look very slow if run on traditional circuits. Despite the drawbacks, the series is attracting more manufacturer interest because it’s a very cost-effective way for car companies to display their ‘green’ credentials, which is a priority in the wake of the disastrous VW emissions scandal that has given the entire automobile industry a bad name. This year, BMW entered the series (and won! ), partnering Andretti Autosport, Nissan has replaced Renault at e.dams, Techeetah has a partnership with DS Automobiles, while Mercedes-affiliated HWA is in action this year, along with Venturi, prior to a full Mercedes programme in 2019-2020. Porsche will enter the series at the same time. Audi, Jaguar, NIO and Mahindra continue with their efforts. Penske too is continuing its own motor programme, which has been linked to a possible Ford partnership. Penske runs Fords in NASCAR and is a major Ford dealer. The problem with all of this is that competing manufacturers inevitably ramp up spending and if they cannot win, they walk away. It’s the classic boom-bust cycle of manufacturer involvement in a motorsport series, which has repeated itself over-and-over in the history of the sport. Things will stabilise with a handful of competitive manufacturers remaining, a bit like F1 at the moment, but then the championship needs to figure out how to keep small teams alive if the big teams are spending crazy money. 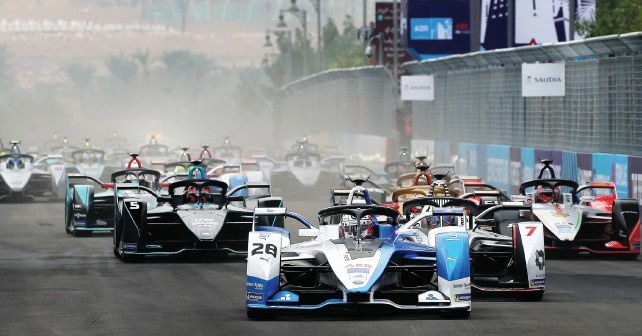 To keep more manufacturers involved over a longer period of time, Formula E needs to lead the way and herein lies the fundamental problem – battery development is not moving quickly enough to give the electric car the opportunity to become mainstream. Nor is it moving quickly enough to improve the Formula E spectacle and increase the relevance of the championship. At the moment, the spectacle is being enhanced by some very clever TV camera work, which disguises the slowness of the cars – using low-mounted cameras to accentuate the speed and fast-panning to make them look good. The narrow street circuits add to the effect. There is a new gimmick this year with the introduction of a 'hyperboost' mode, which will see cars taking unusual lines to collect more power, as happens in video games. Things could, of course, change quickly if there are technological breakthroughs in battery performance, but despite many announcements that new frontiers have been broken, the actual performance is only creeping along. In recent days, there has been an interesting development with the Honda Research Institute, the California Institute of Technology and NASA’s Jet Propulsion Laboratory which have developed new battery chemistry that could present a more energy-dense and environmentally-friendly alternative to lithium-ion. The details of the rechargeable fluoride liquid battery have just been published in Science Magazine, and are interesting in that fluoride batteries have a higher energy density and may last eight times longer than the batteries in use today. The other key point is that fluoride is easily available compared to some of the more exotic battery components that have been seen, which mean that the technology will be commercially-viable if it works. In the interim, however, I believe that hybrid technologies and energy-recovery will remain the mainstay of the industry for many years to come. We do still have a great deal of carbon-based fuel in the world, and using it more carefully while other technologies come together seems to be the way forward. I’m less confident that autonomous cars will be a big thing, except perhaps in cities – because road conditions and human behaviour make it hard for them to be operated safely, particularly when one has to programme what happens in a crash, something which has potentially cataclysmic implications in terms of liabilities. In many ways, it would be more exciting if there were new and astounding technologies arriving all the time, but for now, we have to wait – and Formula E has to survive.